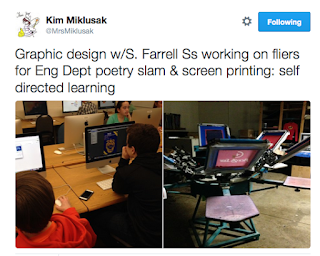 The Collab Blog: Expanding Collaboration Across Schools: A D214 Learning Exchange! 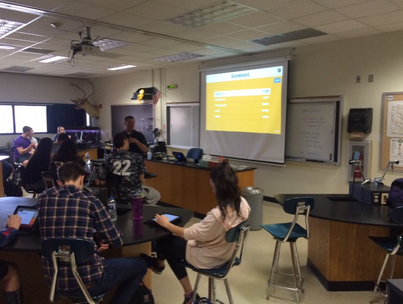 Expanding Collaboration Across Schools: A D214 Learning Exchange! What is a D214 Learning Exchange? If you are familiar with Elk Grove's "Teaming on Tuesdays," think of this first D214 Learning Exchange as a "Teaming on Tuesdays - on the road" connecting two schools. In other words, it is a professional learning experience that gives educators the opportunity to expand their learning networks across schools by visiting multiple classrooms and collaborating with their colleagues to make connections and reflect on their own practice to impact student learning. More specifically it involved: 2 days, 2 schools, 26 teachers, 16 class visits, and multiple conversations to reflect on our learning. After a series of well-received "Teaming on Tuesdays" at Elk Grove High School, our Collab Lab Team began talking about how it would be great to expand this kind of professional collaboration across schools. We thought, "Why not take 'Teaming on Tuesdays' on the road?" 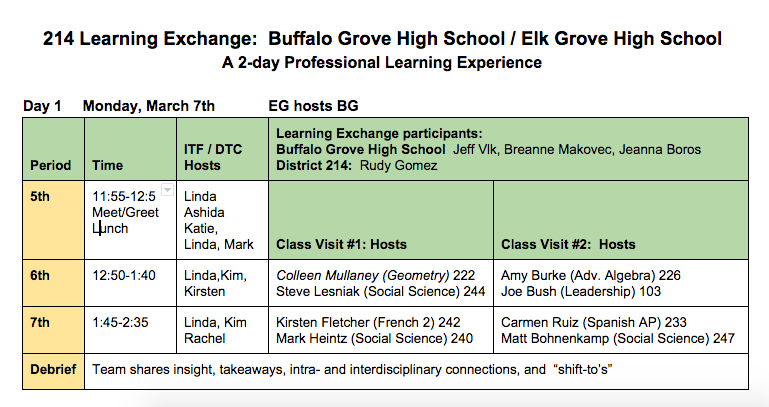 Soon after that conversation, I happened to be collaborating with my colleague Jeff Vlk, the Innovative Technology Facilitator at Buffalo Grove High School, and I proposed the idea to him, to see if some of his colleagues might host short class visits and conversations with their EG colleagues. After talking with Jeff, I met with Spanish teacher Danielle Ossman who happened to mention that she, too, would love to connect with colleagues in other buildings. So, the series of conversations at EG and BG led to an expansion of our original idea idea. We thought, "Why not invite BG staff to visit EG one day, and invite EG staff to visit BG the next?" Jeff and I proposed the the idea by our A-teams and a group of our peers. After a positive response from all, we planned our first District 214 Learning Exchange. We arranged for 8 teachers at each school to open their classrooms for short 8-10 minute visits during two class periods. Then we invited staff from each school to join us for an afternoon of collaborative professional learning. As you can see from the schedule, the Learning Exchange involved interdisciplinary representation from 26 staff participants who hosted classrooms visits and/or participated by visiting classrooms and sharing reflections in follow-up discussions. Click on this link to our storify of tweets from the two-days to get a better idea of what the day "looked like" and what we learned. We'd like to give a big shout out the the administrative teams at both schools for supporting teachers to participate in this experience. And another shout out goes to all of the participants, especially those who opened their classes for peer visits. In the future we plan to expand the Learning Exchanges with other schools. We have also discussed variations for future D214 Learning Exchanges, imagining opportunities for follow-up discussions, either in person, or virtually via Google Hangouts, or arranging for content-alike groups to collaborate in a similar experience. We would even love to see learning exchanges happen across schools on our teacher-led Institute Days. There are many possibilities, but one thing is sure, we will continue to explore ways to expand our professional learning networks with our colleagues at Elk Grove High School and beyond, and reflect on our practice to impact student learning!